As an outspoken and unapologetic moderate, I’ve grown accustomed to taking flak from both trenches on the political battlefield. Even my fellow moderates are quick to offer corrective advice whenever I appear to be tilting slightly toward one camp or the other. Ever since the presidency of Bush II and the financial collapse of 2008, I confess that I’ve directed a little more animosity toward the right than the left. Why? I don’t believe in government of the plutocracy, by the plutocracy, for the plutocracy. I voted for Obama. I can no longer listen to Sean Hannity without rolling my eyes in disbelief. (At least Rush Limbaugh is funny.) I harbor no sympathies for American exceptionalists, gun nuts, neocon interventionists, birthers or apologists for unregulated Darwinian capitalism. So sue me. But sometimes the conservatives are right — and I’m not just referring to their location on the political spectrum. Let me tell you about a recent news story that spoke to my inner righty. Smoking Banned on the Sidewalks of Great Neck, NY. I’ve never been a cigarette smoker; even as a kid I dismissed smoking as an unsavory and vaguely disreputable habit. In the old days, I sat through numerous business meetings with stinging eyes as the noxious blue-gray smoke swirled around the room. But I smarted even more when I saw the news that the village trustees of Great Neck, NY, voted to ban smoking in specified outdoor locations. It’s the kind of mindboggling law that only a left-leaning control freak could love: no smoking on sidewalks along or within 125 feet of Middle Neck Road, the main shopping street. No smoking in Village Green Park. 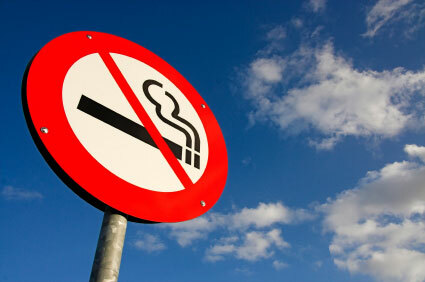 No smoking at benches in municipal parking lots with access to Middle Neck Road and within 10 feet around them. Violators will be slapped with a fine of up to $1000 or 15 days in jail. But what if someone is caught smoking 124 feet from Middle Neck Road or nine feet from a parking lot bench? What if I happen to be traveling through Great Neck and, blissfully ignorant of the local ordinance, decide to light up on a forbidden sidewalk? Even if I were a native Great Necker, how could the village elders reasonably expect me to memorize such a tangle of regulations over my personal habits? I can understand the motivation behind the law — a lot of nonsmokers don’t care to breathe those second-hand fumes. But surely the sky is vast enough to accommodate a swirl of cigarette smoke without impairing the health and well-being of local bystanders. Think of what we inhale when we drive behind a bus. When the government — even the government of a single upscale Long Island community — escalates its restrictions on mundane personal habits, we have to be concerned. Will the government start regulating soda, donuts and other wanton contributors to obesity? San Francisco has already banned high-fat Happy Meals… how much more parental guidance do we need from our elected officials? Will we be forced to jog? Shouldn’t there be a reasonable, inviolable boundary between government authority and personal rights? One of the endemic vices of the elite left is the assumption that the majority of Americans are clueless troglodytes who need to be rescued from their unenlightened ways. Granted, sometimes I have to agree that the elite meddlers aren’t far off base… but it’s their casual presumption of superior authority that speaks to my inner right-winger. The governments of Stalin’s U.S.S.R., Mao’s China and Pol Pot’s Cambodia also presumed to know what was best for their citizens… and millions of those citizens were terminally inconvenienced if they didn’t get with the program. A public smoking ordinance in Great Neck, NY, is trivial by comparison — a mere puff of smoke, if you will — but I still don’t like the direction it represents. Smoking is addictive, unhealthful and often fatal — to the smoker. But nobody’s health or happiness is seriously threatened by an occasional plume of wayward smoke accidentally inhaled in an outdoor setting. Come on, people — we’re the descendants of pioneers, freedom fighters and scrappy immigrants. Let’s not go soft. Ryan, I couldn’t agree with you more on all of this. I agree with you regarding these sorts of lifestyle laws, but the truth is that second-hand smoke has been shown – repeatedly – to be quite dangerous. There was a famous case in Marin County, California back in the 90s that blew the lid of off the issue. A health nut who worked as a waiter in a famous restaurant in Sausalito had a sudden and severe heart attack that left him a cardiac cripple. He sued his employers for allowing diners to smoke inside the restaurant (this was in the mid-90s, when the trend was to disallow butts in dining establishments). He won – mainly because the cardiologists who treated him said that his heart was very healthy, but showed signs of nictoine-induced damage. They testified that had it not been for the second-hand smoke, he most likely would never have had a heart attack at all. As someone who smoked for 16 years before finally quitting, I can attest to the fact that what I exhaled – and more importantly, what came off the end of my cigarette – smelled horrible and burned like crazy. It always kind of threw me, but now I understand that I was toxifying my own (and other’s) environment. Now I have zero patience for second hand smoke, and can honestly tell you it irritates my lungs and sinuses even when I’m outdoors. Rob: I think there’s a big difference between indoor and outdoor second-hand smoke. Indoors it can be noxious; I well remember those business meeting I’d have to sit through with tears in my eyes (and not just because the meetings bored me to tears). And I can see how it would endanger the health of people who frequent or have to work in those environments. But with the bans on outdoor smoking (and it’s not just Great Neck — plenty of towns have these ordinances now) I think we’re catering to the control freaks. Outdoor smoke dissipates quickly enough so that it shouldn’t pose a threat to anyone. I think the Great Neck ordinance got started because some patrons of a dry cleaning shop complained about outdoor smoke drifting into the shop. I can see the problem there, but it’s such an occasional nuisance that it hardly seems worth the mindbogglingly complicated smoking restrictions. Nevertheless, about 10 percent of my waffling mind is attracted to the idea of banning outdoor smoking, because I can’t deny the existence of buildings I dread going into and out of. These are generally workplaces, and the problem is all the employees hovering right outside the doorway, puffing up a storm. Might as well be running the gauntlet than passing through those walls of smoke….Large office buildings and (ironically) hospitals are the problem locations that come to mind. If people want to kill themselves slowly on their own time, I don’t want to take away their right to do so (although I might stop and try to preach to them). Just wondering, is there a way to ventilate problematic outdoor spaces? To answer your question about “a way to ventilate problematic outdoor spaces”. Yes, have the people smoke farther away from the front/side/back doors. You can show you respect their rights to hurt themselves and they in return respect your rights not to smell it. You both win. Also, in regards to living in this country…we must remember that we make the choices that lead to our failures and successes. What you can learn from a family member that dies from cancer or some form of illness is to try to use preventive methods to prevent your own demise. My father has an illness as well and it it his own choosing. Something I am glad I don’t do in excess. Sorry to hear about your father… I think we have to realize that most smokers are addicted. They might have chosen to start when they were young, but by all accounts it’s extremely difficult to quit. Diana: Clearly you think like a true moderate. (That’s a compliment, of course.) Sorry to hear that your mom was a victim of smoking. It’s difficult to draw a geographical boundary between smokers’ and nonsmokers’ territories; I have a feeling that eventually smoking might be confined to the home, where (as you mentioned) it will only harm the smokers’ family members. I am not a smoker and, frankly, I love that you can now go into virtually any public building without having to smell or breathe in disgusting cigarette/pipe/cigar smoke. That said, the studies on second hand smoke have been repeatedly debunked, not only for their methodology but for their conclusions. The EPA clearly had an agenda when it first published the studies that led to all of the non-smoking laws in 1992, since the agency had previously committed to using the studies to pursue anti-smoking legislation. Those studies and their findings were challenged in court and did not hold up…..however, the legislation was already on the books and no one sought to undo it, probably because, like me, everyone considers second hand smoke to be a nuisance at best and a serious health danger at worst. I agree with you Rick, that banning smoking outdoors is going over the line. I remember reading once that, if you ran for 2 miles along NYC streets, you would inhale the toxic equivalent of a half pack of cigarettes, due to auto emissions and other icky city stuff. So, should we ban running on city streets, or require respirators for those who do? The nanny state mentality can rapidly go from mostly protective to mostly restrictive – I think banning outdoor smoking ventures into the restrictive zone, for sure…..
Pricilla: Well said. We face so many health hazards more potentially damaging than an occasional whiff of outdoor second-hand smoke. Bayanlara özel Koltuk altı ve genital bölgeleri beyazlatıcı star white kremle temiz ciltlere kavuşmak istermisiniz? Is this the Turkish delegation? Sorry, wrong number. Rick wrote: It’s the kind of mindboggling law that only a left-leaning control freak could love: no smoking on sidewalks along or within 125 feet of Middle Neck Road, the main shopping street. Why do you associate a strict law with “left-leaning”? Back in my old Romania, the president-dictator Ceausescu, gave a law that banned all kinds of abortions. If applied here in the US, would this law be loved by “left-leaning” control freaks? Valdo: Generally the right favors unlimited individual freedom while the left favors control over wayward individuals to benefit the larger society. Abortion is an interesting twist on that pattern. Yes, it seems that in this case the left is favoring freedom of choice while the right wants to impose controls, but we could just as easily look at it this way: that the pro-choice women want to impose controls over a wayward fetus, while the conservatives defend the individual rights of those fetuses. Just a thought.